When in doubt, add a prologue. I’ve reached a point in my story where I’m looking back at the older passages – not to delete or edit them, because it’s NaNoWriMo and that’s not allowed – but to pad it out and insert sections that relate to the latter half of the story. I realise that some of the second half of the book will make more sense if I can hint at this earlier on in the story. Introducing my character Haimo long before we know his significance will add meaning to his full arrival in the story several chapters later. I noticed one possible problem with my story that I would have to address on a subsequent editing session: a lot of my characters unintentionally have the “ai” letter combination in their names. Zaira, Taika, Taimi, Haimo, Zulaikha. It could prove confusing to readers and so in post-nano editing I will see if I can find more diverse character names. I should add that the 50,000+ word count project plan on my Scrivener is to compensate for the apparent discrepancy between the Scrivener word count and the NaNoWriMo official word count validator. Today’s writing soundtrack: The Husband’s exercise workout instruction videos. It’s really awkward trying to write with someone else in the room. Posted in nanowrimo, writing and tagged musings, nanowrimo, nanowrimo 2015, screenshot, Scrivener, writing on November 21, 2015 by Fiona. 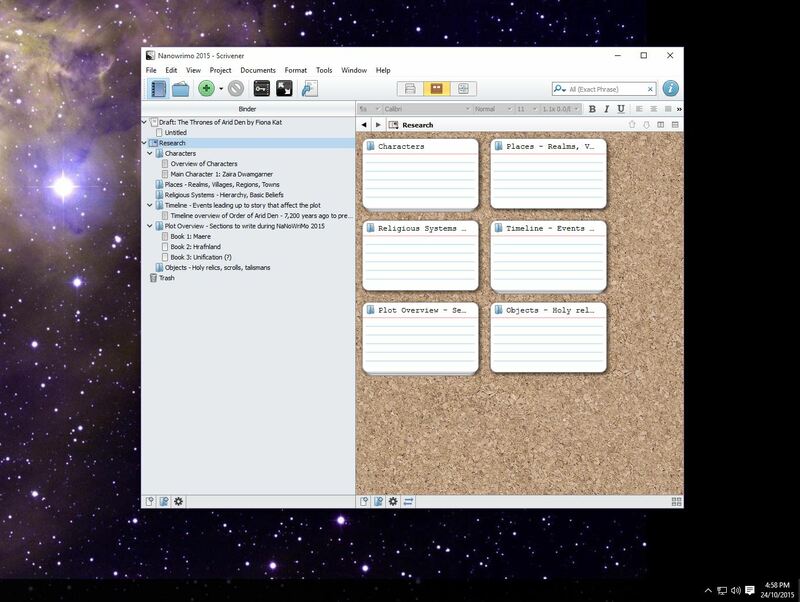 NaNoWriMo Prep: Scrivener layouts time! NaNoWriMo 2015 Planning: This year I’m using a different computer. Now that I have Scrivener installed I have started shifting my plot plans, character profiles and more into a new project. I have to say that it feels real now that I am at Scrivener on the desktop computer-stage. Up to this point my writing has been a blend of ye olde pen on lined paper, sketches and a bit of typing on my lap top, as well as a lot of scouring through name websites. I suspect that most of us with a bent towards story writing own a few baby name books. I find them invaluable. Posted in nanowrimo, writing and tagged creative writing, fantasy, nanowrimo, nanowrimo 2015, screenshot, Scrivener, writing on October 24, 2015 by Fiona.